It was this sense of “fabulous” which has meant that I’ve wanted to go and see this exhibition for a while. So last Saturday I finally made the journey to Manchester to check it out. As a rare treat, Mum came too. What we discovered on the top floor of Manchester Art Gallery surpassed the expectations of either of us, and may have changed the way I will think about Vogue forever. It’s the publication which has always (at least in my lifetime) been seen as The Ultimate Fashion Magazine, the one that truly captures the zeitgeist. The archive on display here does a superb job of demonstrating exactly why this is. And it all comes down to an art. Naomi Campbell by Patrick Demarchelier, 1987. Modern society is so inundated with photography, it’s easy to forget what a good shot can be (Hint: that photo from last night of you & your friends in a bar probably isn’t one). A good photograph is one which tells a story about the subject – not a narrative, but something else. Something which gives you a glimpse into who that person is and makes you feel as though in some way, you understand who they are. Vogue has consistently managed this over 100 years by working with some of the best photographers of the age, and the roster of famous names listed as the photographers throughout this show is impressive. A perfect example of how and why this investment in quality matters occurred just as I was jotting these very notes in a corner of the room. My Mum found me, asking me to come and see a cover she had found. It was the cover shot from July 1993, the debut cover of Kate Moss. I’ve never really seen what all the fuss about her is – until I saw this photograph. It reveals, to use another fashion phrase, a certain “je ne sais quoi” about her. A kind of knowing innocence, candid about being looked at but nonchalant about how she looks. In a single photograph, I saw why she was a big deal. This is a show about a fashion magazine in which the fashion, in the “wear this now” sense, is very much secondary. The show is largely arranged by decade and there is undoubtedly a different style to everything about the 1920s and -30s – the dress, the hair, the photography. Fashion was clearly a different world then, mostly aimed at the lifestyle of moneyed leisure which has no relevance to most modern markets. But from the 1940s onwards, there is at least one photograph in each section which is completely timeless. This is captured in one particular display of covers where I felt that from 1940 onwards (barring 1974), each image could have been of last month’s edition. 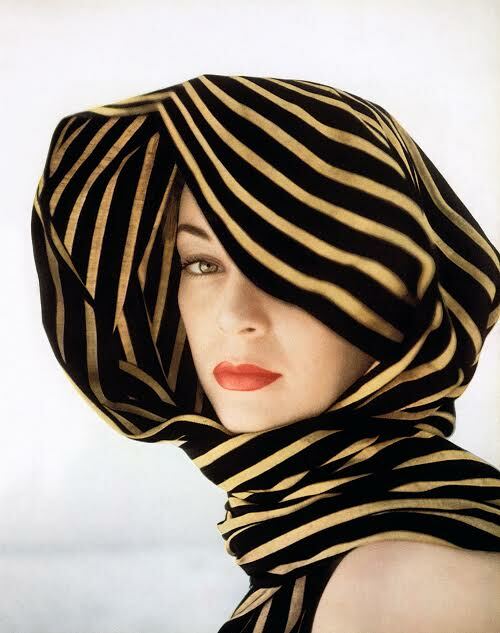 Head of model, Jean Patchett, sheltered with a rebozo of black and gold stripes. Classic elegance at it’s finest. The secret, I feel, is that although fashion changes, the basic elements of aesthetic appeal do not. The majority of the images here are styled with what is instantly recognisable as elegance. It doesn’t matter whether the model is wearing shoulder pads of spaghetti straps, the lines of the outfit flow in a way which will never tire. Fashion magazines and retailers are always keen to promote an idea of fashion as art. But let’s be honest – for most of us, most of the time, it’s just choosing something which will make us look more or less presentable. What’s on show here is the fantasy, made real. It’s about much more than clothes – it truly is art and style here. If I have two regrets about this show they’re that I didn’t see it earlier, and that now I’m sure to start spending more money on Vogue. Image of Naomi Campbell © The Condé Nast Publications Inc. Image of Jean Patchett © Condé Nast Inc. This entry was posted in Exhibitions, Home, Past exhibitions and tagged classic, elegance, fashion, Manchester, photograph, photography, style, Vogue. Bookmark the permalink. An excellent review, I too very much enjoyed this exhibition and seeing all the photos together made me think twice about the essence of Vogue and I will look out for It in newsagents in future which is something I did not previously do!